Director – Joel Schumacher, Screenplay – Akiva Goldsman, Producer – Peter MacGregor-Scott, Photography – Stephen Goldblatt, Music – Elliott Goldenthal, Visual Effects Supervisor – John Dykstra, Visual Effects – BUF Compagnie, Cinesite (Supervisor – Carlos Aguello), CIS Hollywood, Hammerhead Productions, Metrolight Studios, Pacific Data Images (Supervisor – Richard Chuang), Pacific Ocean Post, Rhythm and Hues Studios & Warner Digital Studios (Supervisor – Wendy Rogers), Special Effects Supervisor – David Stump, Makeup Effects/Animatronics – Alterian Studios (Supervisor – Tony Gardner), Production Design – Barbara Ling. Production Company – Warner Brothers. Batman and Robin are called to a robbery at the Gotham Museum of Art. Masterminding the robbery is Mr Freeze, in actuality the former scientist Victor Fries who has a sub-zero body temperature after falling into a cryogenic vat. After a fierce battle with Batmand and Robin, Mr Freeze makes an escape. Meanwhile, botanist Dr Pamela Isley discovers that her superior Dr Jason Woodrue is using serums that she developed to create steroid-enhanced human monsters for sale to foreign bidders. When she confronts him, Woodrue throws toxins over her. The chemicals and plants react together and she emerges as the deadly Poison Ivy, able to kill with a kiss from her poisoned lips and make men into mindless slaves with her pheromone dust. Mr Freeze needs diamonds to power his sub-zero suit. He combines forces with Poison Ivy, who wants to make humanity pay for their cruelty to plants, and launches a plan to freeze all of Gotham City. Poison Ivy is able to use her dust to make Batman and Robin squabble over her. At the same time, Alfred’s niece Barbara Wilson arrives from England. Discovering that Alfred is dying of an incurable condition, she tries to help him. In digging around, Barbara discovers the Batcave. Alfred has made her her own Batsuit and she now emerges to join the others as Batgirl. I am convinced that Batman & Robin is without any question the worst film produced in the 1990s and possibly the worst ever made on a $50 million + budget. Batman & Robin is the only occasion I have ever come out of a film feeling so ripped off by what I had just seen that I stood and told the people queuing up in line to buy tickets for the next session not to waste their money. Tim Burton’s two Batman films, Batman (1989) and Batman Returns (1992), were two of the finest comic book adaptations ever made. From there, it was possible to see that the Batman series might have become the equivalent of the James Bond series for the 1990s. Alas, what then happened was that the franchise was given into the hands of Joel Schumacher who is, in this author’s opinion, the worst director in the world. Joel Schumacher emerged in the 1980s and found fame with the Brat Pack film St Elmo’s Fire (1985) and the teen vampire effort The Lost Boys (1987). Into the 1990s and 00s, Joel Schumacher regrettably joined the directorial A-list with various John Grisham adaptations such as The Client (1994) and A Time to Kill (1996), the Julia Roberts melodrama Dying Young (1991), the excruciating Flawless (1999), the war training film Tigerland (2000), the crime thriller Bad Company (2002), the true life Irish thriller Veronica Guerin (2003) and the ridiculed drug drama Twelve (2010). (See below for Joel Schumacher’s other genre films). In all of these, Joel Schumacher seems incapable of doing nothing other than affecting other director’s style. You get the impression that Schumacher regards directing in much the same as the window dresser he used to be – as a series of interchangeable facades and poses – and is incapable of creating anything of substance beneath that. After inheriting the Batman franchise, Schumacher made Batman Forever (1995). Batman Forever was bad enough but he was then allowed to return for Batman & Robin, showing entirely that the studio did not understand the comic-book, what made the Tim Burton films work or why people hated Batman Forever in the slightest. Just going by the fact that Batman & Robin reunited Joel Schumacher and Akiva Goldsman – respectively the director and screenwriter of Batman Forever – one knew that Batman & Robin would not be good. 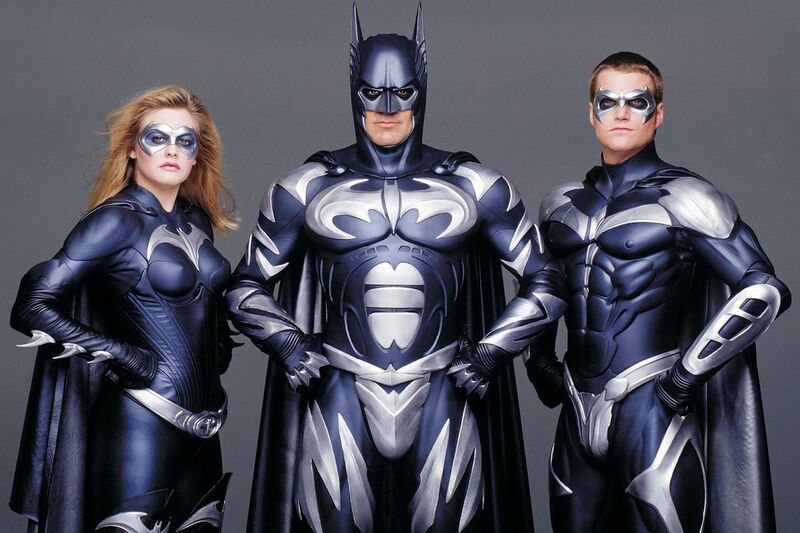 That still did not prepare one for Batman & Robin being a film as staggeringly awful as it is. If you are to compare the Batman series to the James Bond films, it was as though we ended up going from the heights of From Russia with Love (1963) and Goldfinger (1964) with Tim Burton’s two entries to the nadir of Roger Moore era – The Man with the Golden Gun (1974), Moonraker (1979) – within the space of three films. One sat down to watch Batman & Robin with the vain hope that the film might defy the expectations they had of it. However, there was a quick sinking feeling within the first five minutes as one watched Batman and Robin going into action on ice skates to foil a museum robbery and then engaging in an impromptu game of ice hockey with the crooks using a diamond as puck, Arnold Schwarzenegger as Mr Freeze cracking bad ice-related puns, and Robin being frozen alive by Mr Freeze and thawed out just as quickly without even the slightest after-effect. One quickly realised that the entire film was nothing more than a remake of the campy Batman (1966-8) tv series – all that is missing is the comic strip balloons going “Zap!” and “Pow!” Indeed, the only difference between Batman & Robin and the 1960s Batman series is a $70 million budget – the 1960s series at least had its tongue clearly and obviously planted in its cheek. 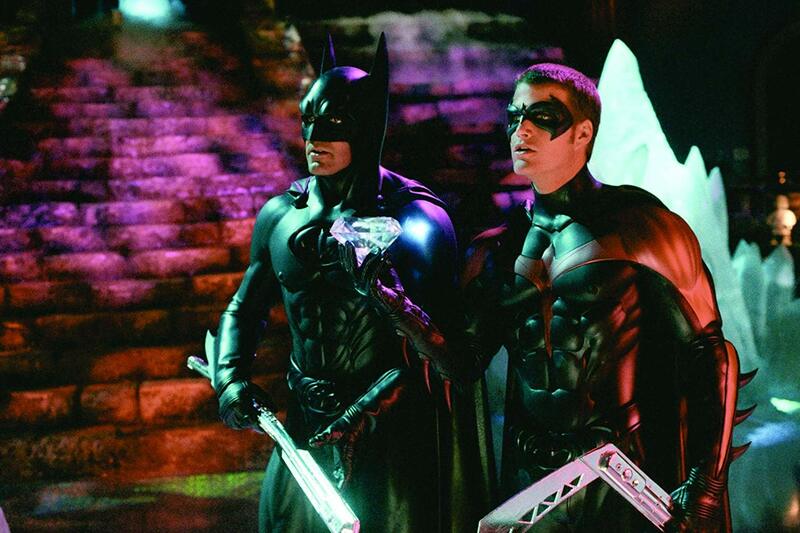 Batman & Robin is a film where Joel Schumacher and Akiva Goldsman seem to assume that the audience for the Batman films and comic-books is comprised of two-year-olds. 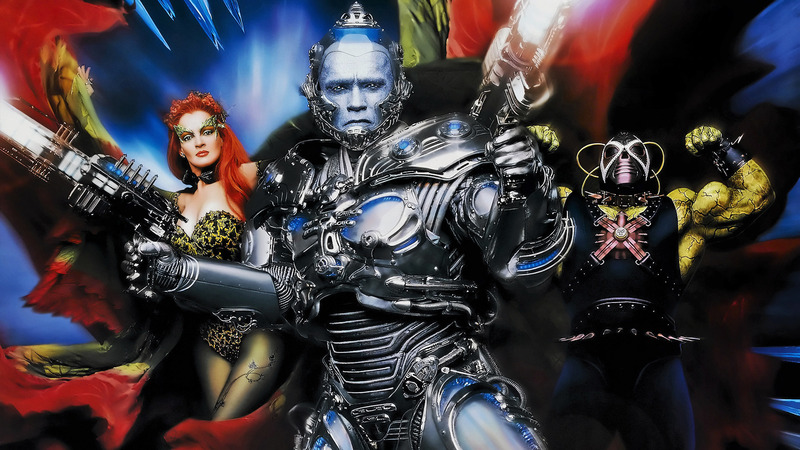 For anybody over that age, they appear intent upon ridiculing them for taking any of it seriously – Mr Freeze walks around in fluffy slippers, is wheeled into Arkham Asylum inside a refrigerator, hides his wife behind a row of frozen dinners. The level of plotting is abysmal – a major device involves Robin fooling Poison Ivy by wearing a set of fake plastic lips!!! Throughout the Batman series, each of the films successively tried to top the previous one in terms of what has gone before. The first film had one villain and a love interest, while the second film featured two villains, one of which was the love interest. Tim Burton and his scriptwriters, though they were entering into the realm of costumed freakshow, always gave the characters fascinating depths. The first two Batman films served to revolutionise comic book cinema by investing larger-than-life characters with psychological motivation. However, after Joel Schumacher and Akiva Goldsman took over, the Batman series became less about instilling psychological motivation in the characters than it became a kind of three-ring circus. Batman Forever had two villains and a sidekick, as well as a love interest; while Batman & Robin tries to up the ante even further by having three comic-book villains, two sidekicks and a new love interest. The results are ridiculously cluttered – both Alicia Silverstone’s Batgirl and Elle McPherson’s love interest, not to mention the appearance of the comic-book villain Bane and Jason Woodrue who is meant to become the dryad villain Floronic Man, make such negligible impact on the film that their characters could have been written out to no noticeable effect. Sadly, what Akiva Goldsman does not realise is that characters in a film should generate from the plot, not from a desire to place as many costumed characters or name stars in a film as possible. Moreover, the origin stories of the characters are cursorily tossed aside with a casualness that is ludicrous. When it comes to Poison Ivy, all that we get is nervous, neurotic Pamela Isley having chemicals tipped over her and then suddenly emerging as a perfectly be-costumed and vampish Poison Ivy – such ridiculous and unbelievable writing is a complete betrayal of the sense of psychological depth that were given to the comic-book villains in the Tim Burton films. Even worse is the Batgirl origin. In the 1960s tv series, the comic-books and the 1990s animated series, Batgirl has always been either Commissioner Gordon’s daughter or niece Barbara who adopts a Batsuit of her own to fight crime. Here Barbara becomes Alfred’s niece who spends most of the film cracking encryption on a cd to discover the Batcave, where she finds a recording from Alfred awaiting her: “I thought you would find this and made you up a costume,” which reveals that the cd was left as a dupe to lure her there. In pre-publicity Joel Schumacher stated: “I was tired of all this dark angst. I wanted to take bring Batman out of the shadows, get him over his childhood and allow him to get on with things.” This sadly displays a fundamental failure to understand what it is that drives the comic-book – the equivalent might be someone making a Superman film and deciding to drop Clark Kent because superheroes should not be wimpy. Unfortunately, a Batman out of the shadows looks all too sadly only like a character in a rubber-costume – his appearance at a charity gala is an unbelievably sad reduction of the dark mystery and power the character has in the comic-books and first two films. George Clooney is capable of portraying a malevolent danger or a sexual charisma in films like From Dusk Till Dawn (1996) and Out of Sight (1998), which is why one anticipated his Batman – but he is wooden in the part. He is also decked out with some incredible bad one-liners – “Didn’t your mother tell you to never play with guns?” he remonstrates Mr Freeze in the middle of battle. At least Mr Freeze is conducted with a reasonable degree of faithfulness to the comic-book counterpart and comes out passably. (Although, if one wants to see a Mr Freeze story where the character and milieu is treated seriously, check out Batman and Mr Freeze: SubZero (1998), a surprisingly good animated film designed only as a direct-to-video companion piece to Batman & Robin, which is untold times better than anything here). Arnold Schwarzenegger is allowed to indulge his penchant for bad puns, getting to make as many cold-related one-liners as possible, but at least he gives a tolerable performance – in fact, the best in the film. (It must be a sad day when one has to say that Arnold Schwarznegger gives the best performance in a film). Uma Thurman gives a badly miscalculated performance as Poison Ivy, drawling like a Mae West and vamping it up as though in training for the part in a Marlene Dietrich biopic she has been oft tipped for in recent years. Everything about Batman & Robin is bad (apart from a reasonable score). The sets are abysmal – they are constructions that no human, not even in an absurd comic-book world like this, could ever sanely think of inhabiting – an observatory constructed in the outheld hand of a Statue of Liberty replica, cells at Arkham Asylum built on the arches of skyscraper-height bridges. The new Batmobile is utterly laughable, having been designed with what looks like a revolving disco light for an engine. I have no problem saying that Batman & Robin is my contender for the worst film ever made on a multi-million dollar budget and naming Joel Schumacher as the worst director currently at work in Hollywood. A Batman 5 was announced even before Batman & Robin came out. This floundered in development hell for more than a decade, with it being widely seen that Joel Schumacher had killed the franchise off. Some of the synopses and floated ideas are around on the internet and make for interesting reading. A further spinoff, the widely ridiculed Catwoman (2004) seem to sink hope even further, until Christopher Nolan did a fine job of bringing respect back to the franchise with Batman Begins (2005) and sequels. (See below for the other Batman films and tv series). Joel Schumacher’s other films of genre interest are:– the comedic The Incredible Shrinking Woman (1981), which is probably his best film; the teen vampire film The Lost Boys (1987); the afterlife film Flatliners (1990); the redneck psycho film Falling Down (1993); the snuff movie thriller 8MM (1999); the sniper thriller Phone Booth (2002); the musical adaptation of the The Phantom of the Opera (2004); the numerology psycho-thriller The Number 23 (2007); and Town Creek (2009) about a Nazi vampire. Joel Schumacher also wrote the script for the all-Black musical Wizard of Oz revamping The Wiz (1978). Akiva Goldsman’s other films of genre interest are:– Lost in Space (1998) based on the 1960s tv series, the witchcraft comedy Practical Magic (1998), I, Robot (2004), The Da Vinci Code (2006), I Am Legend (2007), Angels & Demons (2009), Insurgent (2015), The 5th Wave (2016), The Dark Tower (2017), Rings (2017) and Transformers: The Last Knight (2017). He made his directorial debut with the fantasy Winter’s Tale (2014), followed by the horror film Stephanie (2017). Goldsman has also produced two genre outings for Renny Harlin – a director almost as bad as Joel Schumacher – the monster movie Deep Blue Sea (1999) and the serial killer thriller Mindhunters (2004) – as well as the comic-book adaptation Constantine (2005), the superhero film Hancock (2008), the paranormal investigators tv series Fringe (2008-13), the supernatural Western comic-book adaptation Jonah Hex (2010), Paranormal Activity 2 (2010), Paranormal Activity 3 (2011), Paranormal Activity 4 (2012), the tv mini-series adaptation of Arthur C. Clarke’s Childhood’s End (2015), Guy Ritchie’s King Arthur: Legend of the Sword (2017) and the tv series’ Star Trek: Discovery (2017– ) and Titans (2018– ).. Goldsman also won an Oscar for writing A Beautiful Mind (2001). (Winner for Worst Film in this site’s Top 10 Films of 1997 list. Winner/Nominee for Best at this site’s Best of 1997 Awards).